The must-have Christmas decorations this season have to come from paper boat press. 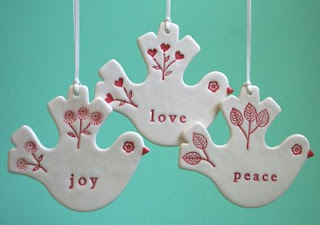 Kylie Johnson has created a range of beautiful ceramic ornaments with inspirational and whimsical sayings that are perfect for tree, mantle, window, table centrepiece or just hanging on a doorknob. Brisbane-based Kylie is herself an inspiration - an accomplished artist (illustration, ceramics), greeting card designer and published author. As well as the ceramic decorations, she also creates quote tags and delightful clay vessels including a range sprinkled with poetry in her signature typeface. Just lovely. While you are picking up your ornaments, keep an eye out for Kylie's beautiful book of poetry count me the stars. This would make the perfect gift for a girlfriend, mother, sibling, or aunt. You can find the paper boat press ceramics range in the paper boat press online store and you'll find a list of Australian/NZ stockists on the paper boat press Website (including Biome online). You'll also find out more about Kylie's world on her blog Instinct and Grace.